The last week of May started the haying season for the Scheckel family out on Oak Grove Ridge in the heart of Crawford County outside Seneca in the 1940s and 1950s. 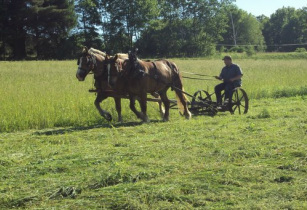 The hay was cut using horses, raked into windrows using horses, and hauled into the barn using horses. Harnessing horses is an art form, and Dad was good at it. Horse harnesses were stored on pegs behind the horses and against the wall of the horse barn, an alcove in side the Big Barn. First the collar, made of leather and stuffed with straw, was placed over the horse’s neck. All the weight that is pulled by the horse is applied to the collar. A good fitting collar was important. If the fit is bad, the horse developed sores. Next, Dad would reach for the harness. He slung the harness atop the horse, and slid the hames into the slots on the collar. I didn’t know that when I was a little tyke. For me, those hames were places to hang onto when Dad lifted us kids up and sat us down on the horse to ride out to the field or to ride home for noon dinner or the end of the work day. The breaching, the big strap around the rump, went over the tail. The breaching is the piece of the harness the horse pushes against when backing up an implement. The bridle would go on next by first placing a bit in the horse’s mouth. The sides of a horse’s mouth are very sensitive, so pulling on the reins pulls on the bit, which pulls the horse’s head from side to side. The reins connected to either side of the bit. This is how the horse is “steered”. The farmer drove the horses with the reins. The reins were black leather straps that extended from the bridle back to the driver. There were supporting rings to carry the reins over the horse’s back, so they won’t get tangled. The belly band ran under the horse, and Dad snapped the reins into the hames. A yoke strap was attached to each side of the horse’s collar. The bottom of the yoke strap had a snap fastener. When hitched to an implement, the snap fastener attached to the neck yoke, a 3-foot wooden bar that is fastened to the horse drawn implement tongue. That neck yoke is suspended from the collar of the harnesses. The “tugs” are thick leather straps attached to the hames and collar and running back on both sides of the horse. A length of chain is attached to each end of the tug strap. The chain is used to hitch the horse to a singletree. The singletree is a wooden 3 to 4 ft piece to which the tugs of the horse harness are fasted. The center of the singletree is attached to a doubletree. The neck yoke wooden bar had a big 4-inch medal ring into which the tongue of the implement would fit. A metal stop prevented the metal ring from sliding back too bar, and it was used for the horses to push against to back up any implement or wagon. The horses were now ready to go to work.